I just received a Kreativ Blogger Award from tomatotots.blogspot.com. Awe shucks! I’d like to thank the Academy, the Associated Press, my agent…actually, I’d just like to thank Megan at Tomato Tots. So, apparently this award comes with strings. There are rules I must comply with, lest I be stripped of my title like a wayward, beauty-pageant queen gone astray. 1. Post the award. Check. 2. Thank and mention the person who gave me the award. Megan at tomatotots.blogspot.com, I thank you. Check. 3. 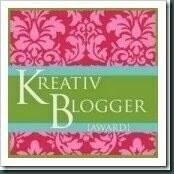 Pass the award on to seven blogs who I think embody the spirit of the Kreativ Blogger Award. Working on it. More on this later. 4. Name seven things about myself that others don’t know. Here goes: I don’t eat meat (beef, pork or lamb). I don’t eat dairy. I don’t eat wheat. (Uh oh, I’m starting to sound like my last post!) I own over sixty pair of shoes, only three or four of which are flats. I was once killed in a very bad horror movie. I am a closet Miley Cyrus fan: Party in the U.S.A. has been my ring-tone (01 Party In the U.S.A.- give it a minute to load, sit back and enjoy). And Megan, just for you, (feminists, cover your eyes) I was once Miss Teen Calgary and actually possess my very own tiara! Jealous much? Check. 5. Notify my seven Bloggers about their award and post a link to their blog. Will do. See #3 above.